The large screen yet ultra-thin Garmin nuvi 1490T offers multiple-point routing to make your journey - anywhere in Europe - as easy as possible. It has Lane Guidance and Junction View for supreme route awareness. Garmin nuvi 1490T includes Bluetooth wireless technology for hands-free phone calls, pan-European premium traffic avoidance and ecoRoute to calculate a more fuel-efficient route. The Garmin nuvi 1490T is also compatible with the optional cityXplorer download to get you around on foot or public transport, and you can even add City Guides to make the most of your time in town. Garmin nuvi 1490T has been discontinued. Accessories, spares and parts are still available for your nuvi 1490T, as are the road maps. The large screen yet ultra-thin Garmin nuvi1490T offers multiple-point routing to make your journey - anywhere in Europe - as easy as possible. It has Lane Guidance and Junction View for supreme route awareness. It includes Bluetooth® wireless technology for hands-free phone calls, pan-European premium traffic avoidance and ecoRoute™ to calculate a more fuel-efficient route. It is also compatible with the optional cityXplorer download to get you around on foot or public transport, and you can even add City Guides to make the most of your time in town. Garmin nuMaps Guarantee - simply register your new Garmin nuvi 1490T within 90 days of first using your sat-nav to see if a free map update is available. See map coverage below for more details. Garmin nuvi 1490T’s pocket design means you can take it anywhere. Use to its full potential by downloading cityXplorer to navigate selected cities via trains, tubes or buses* as well as on foot. Add an AA City Guide for your chosen city to find out about all attractions and places to eat, stay and shop. * Note: Public transport data may vary between cities. Keep your eyes on the road and both hands on the wheel with Garmin nuvi 1490T’s integrated Bluetooth® wireless technology, microphone and speaker. Just pair with your compatible mobile phone and talk hands-free through the Garmin nuvi 1490T. The ecoRoute fuel-saver feature enables you to choose a fuel-efficient route which could even save you money as well as fuel. See the cost of the journey as you plan it and get scored for your performance with the Driving Challenge - good for identifying areas for improvement. The Garmin nuvi 1490T, like all Garmin sat nav's, gets its speed camera data from the Cyclops speed camera database. The database provides advanced alerts to fixed, average speed, mobile, variable, temporary roadwork, red light and red light speed cameras. As you approach a camera, your device sounds an alert. Subscription charges apply. Click here to read more about the Cyclops speed trap database. The Garmin nuvi 1490T has been designed to be plug and play, and as such can be transferred from vehicle to vehicle with ease. The Garmin nuvi 1490T is powered via the supplied vehicle power cable. The Garmin nuvi 1490T then attaches to your vehicles windscreen via the Garmin nuvi 1490T suction cup mount. Alternatively using the supplied dashboard disk you can mount the suction cup mount on top of your dashboard instead. Garmin nuvi 1490T comes preloaded with detailed City Navigator street maps for the UK, Ireland, Western and Eastern Europe (42 countries) provided from map supplier NAVTEQ. Rolling screen transition, accelerated map redraw and routing capabilities make screen zooming even smoother and ensure the navigation always matches your pace. Further Garmin nuvi 1490T maps are available microSD card which insert directly into the Garmin nuvi 1490T. 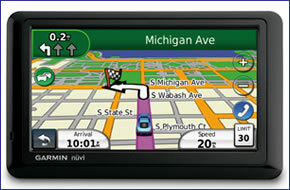 Available Garmin nuvi 1490 maps include USA and Canada, Australia and New Zealand, Middle East and Southeast Asia. Garmin nuvi 1490T maps. Looking for accessories and spares for the Garmin nuvi 1490T? All parts are genuine Garmin product and specifically designed for use with the nuvi 1490T. Accessories available to purchase include a 5-inch carry case, car charger, winsdscreen mount, a weighted dashboard mount and an air vent mount kit. Along with these accessories, it's also possible to buy replacement parts such as suction cup mount and vehicle charger. View all of the nuvi 1490T accessories here. Looking for sat nav maps for the Garmin nuvi 1490T? All mapping comes on microSD card with SD card adaptor and is genuine Garmin product and specifically designed for use with the nuvi 1490T. Countries available to buy include: UK and Ireland, France and Benelux, Full Europe, North America, Australia and New Zealand. View all of the nuvi 1490T compatible maps here. Question: Is there cable I can plug into my Garmin nuvi 1490t sat nav that can I can charge in the car with USB connection, instead of cigar socket? 1. The voltage may not be correct for your device. 2. Unlike genuine Garmin cables e.g. traffic and vehicle power cable, third party cables are unlikely to provide traffic information. Genuine Garmin nuvi 1490T power cables can be viewed and purchased here. Question: I have a Garmin sat-nav (nuvi 1400) and would like to know whether it is possible to update the maps but just for Spain (not Western Europe only Spain). If the answer is yes, I would appreciate if you could describe the procedure and the costs of performing this operation. Answer: All nuvi 1400/1490 maps are listed here. The map you require is Spain/Portugal (there is no Spain only map card). The map card inserts into the slot at the side of your nuvi 1400. Further map installation info. Question: My Garmin nuvi says 1490 but not T model. I want to buy a France mapping disc but wanted to know if the 1490T would fit my 1490? Answer: The 'T' in nuvi 1490T signifies that the nuvi model sat nav has Traffic. Mapping is completely unaffected by the 'T' - mapping will work on both 'T' (traffic) models and non 'T' (traffic) models. You can buy compatible Garmin City Navigator (street-level) maps of France and Benelux on SD/microSD Card for your Garmin nuvi 1490. Do you have a question about the Garmin nuvi 1490? Submit your question via our contact page.